The first official week of Boston training didn't quite get off to the start I was hoping for. After running in long pants and the other winter gear last Saturday and Sunday mornings, Summer decided to make a return at the Winter Solstice. Monday was actually quite nice in the 50's and I got in an easy 6 along the Neuse at my normal pace. Tuesday and a return to the track. 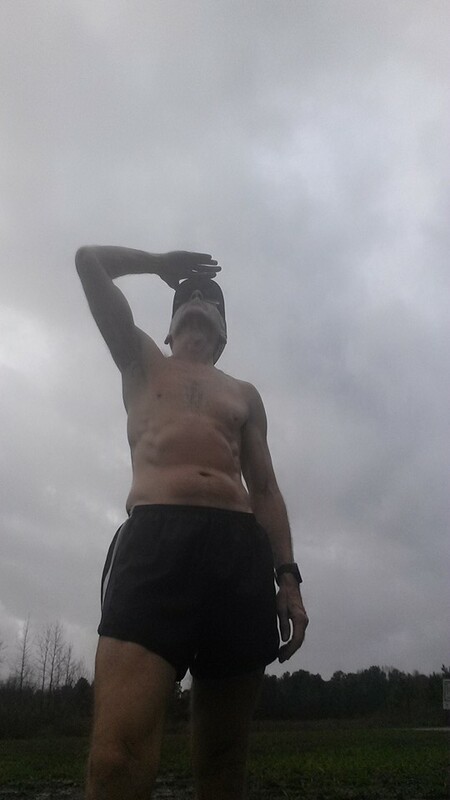 Hard to beleive it was in the low 70's and I was doing speedwork shirtless. Although I was hitting my splits ok for some 800's at 10k pace and 400's at 5k pace it was harder than it should have been. Wednesday I was busy and I needed a rest day anyhow with my upper hamstring a bit angry. Thursday am was just a miserable morning. 72F and 100% humidity. Bad enough in July but really tough when you are acclimated to colder weather. A decent pace again but it felt like work trying to breathe. Friday morning, Christmas morning. Sadly no Fun Friday this week with just too much going on with the holiday but it was probably a good thing. I felt worn down and struggled for 6 miles at much slower than normal as it was in the low 70's and humid again. No way I could have even run 1 mile with Laura at even our normal warm up pace. At least the hamstring continued to improve. are those snow clouds? 72F !! I was hoping to get in a long run on Saturday, at least 16 miles and maybe more. Another morning of 100% humidity and upper 60's though made for another slow one. I didn't feel bad but just got stuck in a slow groove about 20 seconds per mile slower than my normal. I decided to quit at 12 and save it for a better day. Sunday was another easy 6. I waited a little later and the sun came out making the 64F and 96% humidity feel worse but at least I had a bit of zip back in me. I'm sure getting an extra 1.5 hours of badly needed sleep helped with that. So, there you have it. A couple of good runs and some miserable running weather for a total of 42.5 miles for the week. The weather is looking like it will gradualy get back into more normal temperatures for the season and I hope with it I began to feel better and able to get in the miles and workouts I have scheduled. Until then, stay tuned.